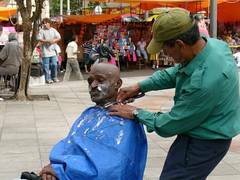 A barber plies his trade in a Porto Alegre square frequented by people from many different walks of life. The excitement and brilliance of the carnival, the grace and skill of soccer, the exotic tropical beaches and the uproar of political scandals: these are some superficial snapshots of Brazil, a country rich in natural resources and creativity but battered by poverty. What is the country that will host the World Council of Churches' 9th Assembly next February really like? Marked by its contrasts, Brazil is the largest Latin American nation and the fifth largest land mass in the world. Its 8.54 million square kilometres (slightly more than twice the size of the expanded European Union) are inhabited by 170 million people (approximately a third of the EU's population). Its gorgeous Atlantic Ocean beaches are world famous. However, its geography is marked by enormous diversity: arid deserts, plains and savannahs, marshlands, mountain ranges as well as jungle and forest areas, many threatened by illegal land clearing. Huge cities like Sao Paulo and Rio de Janeiro (16 and 14 million inhabitants respectively) co-exist alongside regions that have an extremely low demographic density. Diversity is also a characteristic of Brazil's population, originating from more than 40 ethnic groups and mixed with native indigenous peoples. From the Portuguese to "Lula"
Prior to being colonized by the Portuguese in 1500, Brazil was inhabited by indigenous peoples. The majority peaceful, they were decimated by the violence and the illness brought by the white man. Today, there are some 750,000 indigenous in the country. As of 1530, the colonizers brought slaves from Africa. Slavery lasted for more than 300 years and more than 3.5 million people were bought and sold, the highest number registered among the so-called countries of the New World. The black population today amounts to 75 million people (44 percent of the total). Independent since 1822, Brazil became a republic in 1889. Independence, however, was declared by a foreign prince, the Portuguese Dom Pedro I and the republic was not proclaimed by a revolutionary but by the leader of a coup, Field Marshall Deodoro da Fonseca. From then on , Brazil suffered a series of dictatorships and coups. The most recent took place in 1964. The military took power, suppressed civil rights, exiled, tortured and killed their opponents, governing in a despotic fashion for 22 years. After less than two decades of continuous democracy, Luís Inácio "Lula" da Silva, a former union leader, took office as president in January 2003. The change, however, has not shielded the country from accusations of corruption. Today, Lula and his Workers Party face accusations related to dubious loans, influence trafficking and embezzlement. Throughout most of the 20th century until the 1970s, Brazil enjoyed its status as a so-called "Country of the Future". Its incalculable natural wealth helped justify this image, including the fact that 60 percent of the Amazon jungle and 20 percent of the planet's potable water reserves lie within its borders. With 800 million hectares of farm land, the country has yet to carry out an agrarian reform. Many of the farmers expelled from the countryside live in misery in the cities. Others struggle to transform this reality. The Landless Workers Movement is one of the largest of its kind in the world. Brazilian industry began to develop in the 1950s leading to economic growth but also to a concentration of wealth and overwhelming urbanization. The 1980s were marked by economic stagnation with over 30 million unemployed and informal workers and 22 million impoverished. At the same time, the concentration of income was aggravated. The 10 richest percent of the population appropriated half of the national income, while the 40 poorest percent barely received 8 percent. Minimum monthly wage is 300 reales (some US$ 130). The ninth leading economy in the world, Brazil has an enormous debt: US$ 237.9 billion (equivalent to 39 percent of the GDP). Though high inflation rates decreased as of 1994, the purchasing power of the population continued to decline. Recently, exports have increased, breaking a historic record in 2004 when they peaked at 32 percent and surpassed US$ 96 billion. The poverty of the population also led to a deterioration in overall health, increasing nutritional problems and transmittable diseases. Close to 120,000 babies die each year before reaching their first birthday. Around 97 percent of children aged 7-14 go to school but the country suffers from serious educational deficiencies. Of every 100 children who enter the school system only eight finish high school. Among Brazilians over the age of 15, 12 percent are illiterate. Low education levels, poverty, a lack of opportunities and increasing drug trafficking are among the causes of violence in the big cities. Battered by so many problems, civil society has organized itself. Today there are an estimated 20 million activists and volunteers in the country. Many of those who volunteer are also involved in different churches. The church with the highest number of faithful is the Roman Catholic Church with 126 million (74 percent of the population). Close to 25.5 million (15 percent) of Brazilians are Protestants. Of that total, around 85 percent are Pentecostals. Orthodox Christians are about 250,000 people. The followers of Afro-Brazilian and syncretic religions like Candomble, Xangô, Macumba and Umbanda make up 4 percent of the population. There are approximately 500,000 Muslims and 100,000 Jews, together with other smaller religious groups. Around 7.3 percent of Brazilians claim to have no religious affiliation. The Brazilian ecumenical movement sought to draw closer to the people through solidarity and gained strength in the 1970s during its resistance to the military dictatorship. In 1982 the National Council of Christian Churches (CONIC) was created. It brings together the Evangelical Church of Lutheran Confession in Brazil (IECLB), the Anglican Episcopal, Reformed, Methodist, United Presbyterian, Syrian Orthodox and Roman Catholic Churches. 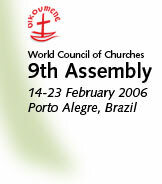 It was the CONIC that invited the World Council of Churches to hold its 9th Assembly, the first on Latin American soil, from 14-23 February, 2006 in Porto Alegre, the cradle of the World Social Forum. (*) Rosina Duarte is a Brazilian free-lance journalist and carries out communication projects with low income sectors through the Free Agency for Information, Citizenship and Education (Alice) in Porto Alegre.